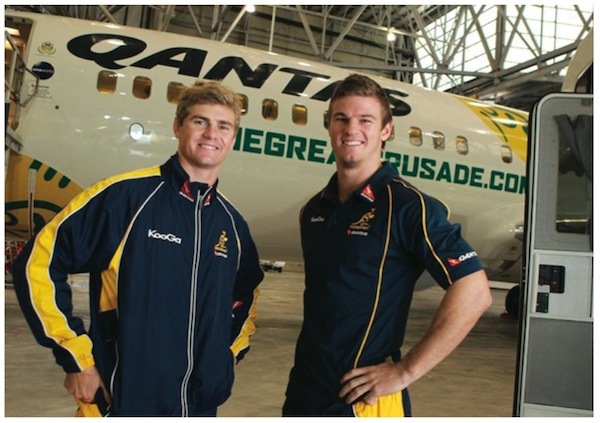 Qantas has been the official naming rights partner and official airline for the Australian Wallabies since 2004. It is a sponsorship of which the airline is particularly proud, as it marries Australia’s international flag bearer with one of our great sporting teams. So when Emirates was announced as the official airline for the 2011 Rugby World Cup in New Zealand it presented an unprecedented dilemma. On the one hand, given the commercial importance of the trans-Tasman route, it was unthinkable that Qantas would hand over perceptual ownership of it to a major international competitor for the duration of the Rugby World Cup. On the other hand, Qantas understood and wished to adhere to the rules protecting sponsors and their investment. Qantas was legally prohibited from producing content within 500 metres of any World Cup event and this restriction was acknowledged and respected. The challenge was therefore to out-think and outperform the official sponsors without stepping outside the rules of the game. It was crucial that Qantas supported its trans-Tasman route and promoted New Zealand as a destination within Australia. It was a matter of pride that it gave maximum exposure to its ongoing sponsorship of the Wallabies team. The question was how to turn a disappointment into opportunity, and how to demonstrate leadership while embracing prohibitive restrictions. to have a positive effect on forward bookings to New Zealand – as all airline tickets had been sold weeks prior to the World Cup competition, we were looking to generate trips down the track. We determined early on that we had to create a campaign that complemented the World Cup, but would engage Wallabies supporters in its own right. It needed to centre on the core Qantas business of ‘travel’, showcase New Zealand, and yet still have the Wallabies and their success as its primary focus. Importantly, we didn’t feel it appropriate to try and ‘buy’ the sort of exposure we craved. This needed to be something that took on a momentum of its own, that generated good will through the enthusiasm of the participants, and demanded attention through its inherent entertainment and news value. In addition, it needed to play by the rules, but not take those rules too seriously. We felt that as a non-sponsor we could afford to have some fun, while adding weight and support to the Wallabies team. None of the above felt like traditional advertising. Our strategy was to provide content that people would upload and want to share. We were on something of a ‘crusade’ and we wanted rugby supporters to feel that they could come on that crusade with us in real time and share the thrills, spills and misadventures that were bound to occur. 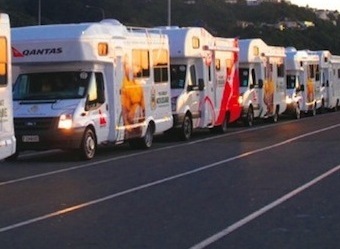 The big idea was ‘The Great Crusade’: 25 branded campervans following the Qantas Wallabies across New Zealand filled with supporters, tour hosts, a band and a film crew. 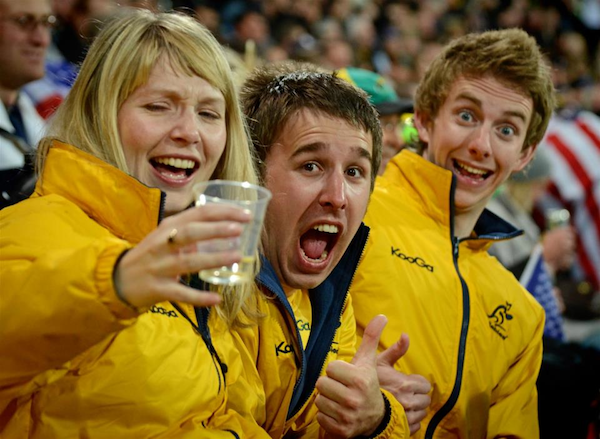 An online competition encouraged potential participants to make a video proving they were huge Wallabies supporters. Judges looked for originality, but more than anything we wanted diehard Wallabies supporters with bags of personality. In the event, 128 supporters were chosen to travel 53,850 kilometres across both islands of New Zealand participating in 45 different activities across 39 days. They went to 10 Rugby World Cup matches, enjoyed 16 gigs by our resident and guest bands and made three bungee jumps, including one off Auckland Bridge. Living up to their reputation as true Aussie rugger buggers, they drank too much, partied too hard, drove large campervans across perilous mountain passes and undertook death-defying activities such as white-water rafting. All 128 returned home alive, if not well. The star of the web and TV series was actor Phil Lloyd, best known as Myles Barlow from the Review TV series. Throughout the tour, he was Toby Withers, hapless reporter for Highly Strung magazine and specialist in nontennis racquet sports. He was helped in his efforts to come to terms with rugby by John Eales, Matt Burke, Chris Hardy, Gordon Bray and the Wallabies themselves. Over 35 days, he lodged 21 episodes online and on TV, and put together two 30-minute specials. The idea was that this would be a truly spontaneous and ‘live’ documentary, recording the misadventures of our travelling caravan. Spontaneity requires planning. We recruited the services of top film director Gregor Jordon (Two Hands, Buffalo Soldiers, Ned Kelly), and the writing and production services of Nathan Earl from The Chaser team. Scripts were written daily, on the spot and on the run for the 35 days of the tour. The site did a great job of showcasing New Zealand. Visitors were met with 20 New Zealand attraction information pieces promoting New Zealand on the site. Wellington and Auckland content pages were viewed 3870 times alone, with an average two minutes spent exploring these important gateways. 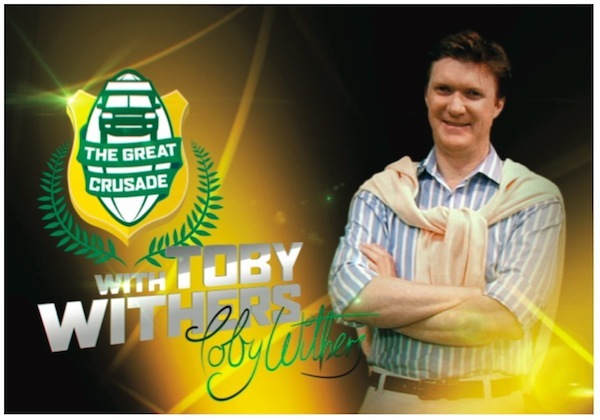 The Great Crusade series ran online with more than 12.7 million views to date. Additionally, The Great Crusade series ran on Q in-flight TV for the duration of the tournament, totalling over 12,000 screenings on domestic flights, bringing New Zealand and the Qantas Wallabies to 1.9 million passengers. It generated 49 online stories, 17 print articles, 12 broadcast pieces, including six segments on the Today Show, and countless radio interviews. Australians themselves picked up ‘The Great Crusade’ and ran with the story through social media. Over 3500 tweets, blogs, Facebook ‘likes’ and online comments reached in excess of 15 million people. There were nearly 350,000 views on Qantas’ YouTube channel. For six weeks ‘The Great Crusade’ became an entertainment phenomenon. Such was the power of its unique narrative that it was even nominated for an Emmy Award for Digital Fiction and won a Gold Lion at Cannes. Thegreatcrusade.com became compulsive viewing for anyone interested in the Rugby World Cup. It generated 80 million media impressions, 20 million unique browsers and 428,318 clicks with 199,364 unique visits to the m-site. bookings to New Zealand saw an overall lift during the Rugby World Cup, peaking during the core rounds and the finals series. While the competition generated its own coverage of New Zealand, we believe our 30-day voyage around less-known parts of both islands contributed significantly to this uplift.